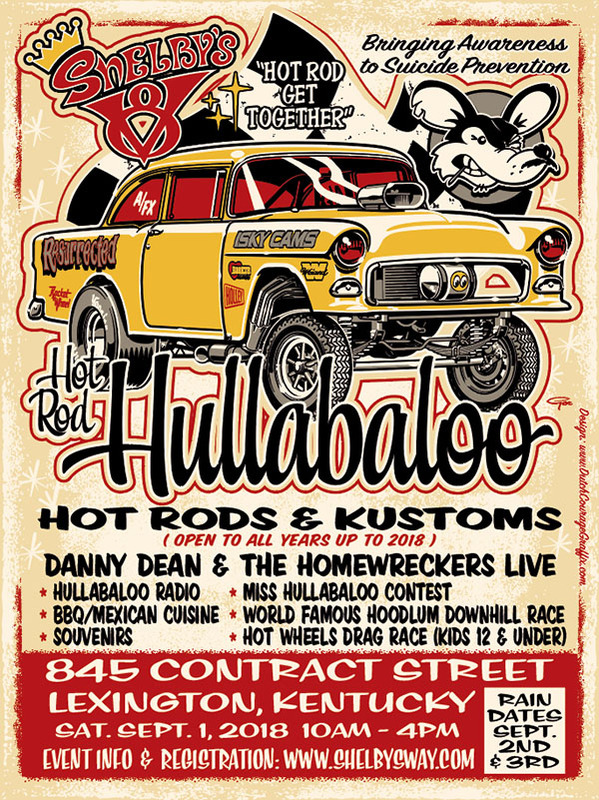 The annual Hot Rod Hullabaloo is coming up on Saturday September 1 (Labor Day Weekend) and we hope that you can be there! The show is focused on pre-’68 models, but all makes, models and newer vehicles are welcome to attend! There will be music, bbq, souvenirs, vendors and the world famous “Hoodlum Down Hill Race” and the Miss Hullabaloo Pageant. We expect over 700 vehicles this year! This hot rod get together is absolutely free to participate in! Shelby’s Way will be collecting donations for the cause (Bringing Awareness to Suicide Prevention) as well as selling t-shirts and other merchandise to raise money for the 501c3 non-profit. So, please spread the word to your friends and family about the event and the cause behind it. We are asking that all vehicles register (for free) to the event this year. Please go to https://shelbysway.com to pre-register or inquire about vendor information today. We will be doing a raffle for a ton of prizes including a complete Chevy motor by our sponsor Bachman Chevrolet! Along with our media partner, Cumulus Broadcasting, there will be music up and down the street including several bands and our Hullabaloo radio DJs. Headlining this year’s event will be Danny Dean and the Homewreckers. For more information and raffle tickets, please visit: https://www.shelbysway.com. See you Saturday September 1st.